The oral cavity is comprised of mucosa, glands, muscle, teeth and sensory receptors. The sensory capabilities of the oral cavity include pain, temperature, proprioception, light touch, vibration, and taste. Efferent innervation supplies muscles of mastication, the tongue, and autonomic reflexes. Below is an overview of the neuroanatomy, with particular paragraphs highlighting the most relevant elements. Pertinent to burning mouth syndrome (BMS), the lingual branch of the mandibular nerve (V3) supplies the anterior two-thirds of the tongue. It has superficial and deep fibers, which have small receptive fields and low thresholds, creating a highly sensitive sensory field. Pain and temperature in the mouth are sensed by both simple free nerve endings and by more organized nonmyelinated endings. Sensory innervation of the periodontal ligaments provides proprioceptive information about pressure on the teeth and oral stereognosis (perceiving the form of an object) as well as jaw opening and salivation reflexes. In general, the anterior and midline portions of the oral cavity tend to be more sensitive than the posterior and lateral aspects to discriminatory touch and warm temperatures. Cold temperatures are perceived more uniformly throughout the mouth. Discriminatory tactile fibers synapse in the principal sensory nucleus, cross midline, and ascend in the medial lemniscus to the ventroposterior medial nucleus of the thalamus (VPM). Afferent proprioceptive fibers of V3 from masticatory muscles (masseter, temporalis, medial and lateral pterygoids) pass through the principal sensory nucleus. Their cell bodies are located in the mesencephalic nucleus superior to the principal sensory nucleus, and they synapse in the motor nucleus medial to the principal sensory nucleus. Nociceptive (pain and temperature) fibers pass through the principal sensory nucleus and descend before synapsing in the large spinal trigeminal nucleus of the medulla. The spinal nucleus contains 3 subnuclei from cranial to caudal: oralis, interpolaris, caudalis. Generally, pain fibers synapse in the subnucleus caudalis prior to crossing and ascending in the spinothalamic tract. Of importance with respect to burning mouth syndrome (BMS), the spinal nucleus may be important in central sensitization of peripheral trigeminal nerve fibers via alterations in NMDA (N-methyl D-aspartate) receptors. Chemoreceptors for taste are supplied by the chorda tympani branch of the facial nerve (VII) to the anterior two thirds of the tongue, while the posterior third of the tongue and pharynx are supplied by the glossopharyngeal nerve (IX). The chorda tympani is probably most responsible for taste alterations in burning mouth syndrome (BMS). A small population of taste receptors on the soft palate is supplied by the greater superficial petrosal nerve branch of the facial nerve. The larynx bears some taste receptors that are innervated by the superior laryngeal nerve. Trigeminal nerve (V) endings also supply some sensation of taste. They respond more to chemically active compounds such as ammonia, menthol, and capsaicin. Noxious stimuli can stimulate salivation and the cough reflex via these trigeminal afferents. Mechanical and gustatory stimuli incite parotid, submandibular, and sublingual salivary flow. In particular, stimulation to the anterior tongue is effective in activating submandibular and sublingual glands, while posterior lingual stimulation is more effective at engaging parotid flow. Ions present in saliva, particularly sodium, produce continual low-level stimulation of taste receptors. In theory, the content of saliva may affect sensitivity of taste receptors. This may explain how medications and metabolic conditions alter taste perception (dysgeusia) or produce novel tastes, such as bitter or metallic tastes in the mouth (parageusia.) Acute decreases in the quantity of saliva do not appear to affect gustatory sensitivity; however, chronic deprivation (as in Sjögren Syndrome or after radiation therapy) does appear to result in decreased sensitivity of receptors by trophic effects. The pathophysiology of burning mouth syndrome (BMS) is not understood. It was originally considered a psychogenic illness; however, a neuropathic mechanism for burning mouth syndrome (BMS) is currently favored. This is based on objectively measured abnormalities of physiologic responses of the trigeminal nerve in burning mouth syndrome (BMS) patients. [7, 8] There is also evidence to suggest histopathologic changes in nociceptive fibers in BMS patients. The differentiation between a peripheral versus a central etiology has not been determined. Studies focusing on trigeminal nerve alterations have found both hypersensitivity and hyposensitivity as well as large and small fiber neuropathy. [14, 8, 7, 15] These studies suggest that burning mouth syndrome (BMS) may have multiple etiologies producing similar symptoms. Burning mouth syndrome (BMS) has been associated with oral parafunctional habits such as bruxism, clenching, and tongue thrusting. The bruxism and clenching are increased with anxiety, which is also associated with burning mouth syndrome (BMS). Although psychogenesis is no longer regarded as the primary cause, it may exacerbate symptoms. Whether burning mouth syndrome (BMS) has a neurologic abnormality in common with parafunctional behaviors has yet to be adequately investigated. Good epidemiologic data documenting incidence and prevalence of burning mouth syndrome (BMS) are lacking. Statistical values vary widely and are likely affected by variable definitions of burning mouth syndrome (BMS). The overall prevalence is roughly 4%. Women are 3-7 times more likely than men of a similar age to experience burning mouth syndrome (BMS) symptoms. [20, 21] Burning mouth syndrome (BMS) is rarely observed in patients younger than age 30 years, and prevalence may increase from 3- to 12-fold with increasing age. No racial or ethnic predilections have been reported. The absence of any of the above symptoms does not exclude a diagnosis of burning mouth syndrome (BMS). See the image shown below. Classically, 3 major symptoms are associated with burning mouth syndrome (BMS): pain, dysgeusia, and xerostomia. These occur nearly continuously for at least 4-6 months. The complete triad (pain, dysgeusia, xerostomia) is most commonly found in peri-menopausal and postmenopausal women, while other populations may have fewer symptoms. Pain is typically the major symptom. The pain is described as burning, scalding, tingling, or numbness. It is bilateral, typically involving the anterior two thirds of the tongue or tip. The hard palate mucosa and lips may also be involved. The buccal mucosa and floor of the mouth are atypical sites. In patients with dentures, alveolar ridges/gingiva are common sites. Involvement of the throat may be suggestive of allergy or gastroesophageal reflux disease (GERD). The pain may be mild to severe. It may be constant or worse at the end of the day with no pain on waking. It may or may not interfere with sleep; typically it does not. Food and drink may or may not exacerbate symptoms. Hot, acidic or spicy foods typically aggravate pain in patients who report worsening of symptoms with ingestion. Speaking may also exacerbate pain in select individuals. Dysgeusia is present in up to 70% of cases and may take the form either of a persistent taste in the mouth or altered perception of tastes. Dysgeusic tastes may be bitter, metallic, or mixed. Alterations may take the form of decreased perception of sweetness or intensified sensation of sweet or sour flavors. Xerostomia is a symptom in up to 64% of patients. Patients may not volunteer symptoms of xerostomia but affirm it on direct questioning. Xerostomia in burning mouth syndrome (BMS) is unlikely to be objectively confirmed by quantitative tests of salivary function. Some evidence suggests differences in salivary composition; [16, 17] however, this relationship to symptoms of pain or dysgeusia is not clear. Burning mouth syndrome (BMS) may be associated with various other nonspecific symptoms. [24, 25] Elicit information about bruxism or clenching, which may cause headache, ear, temporomandibular joint pain, or myofascial pain in masticatory, neck, shoulder, and suprahyoid muscles that can be associated with burning mouth syndrome (BMS). Patients may not be aware of these parafunctional behaviors, but bruxism can be observed by family members during sleep, particularly if it is loud. The patient may also notice clenching if made aware. Other signs of bruxism include worn tooth enamel, tooth sensitivity, or superficial ulceration of buccal mucosa. Tongue thrusting in patients with burning mouth syndrome (BMS) may be identified by having the patient swallow a liquid while smiling; leakage through the teeth is suggestive. Patients or family members may also report puckering or tightening of the lips during swallowing. In true (idiopathic) burning mouth syndrome (BMS), no clinically evident lesions should be in the oral cavity, including the most symptomatic areas. A thorough examination should be conducted to investigate alternate diagnoses. Oral inspection may identify any areas of atrophy (see first image below), erythema, leukoplakia (see second image below) erosion, or ulceration (see third image below). Bimanual palpation of the tongue, tonsils, and floor of the mouth aid in evaluating deep tissues for masses or infections. Dental examination may reveal damage to enamel or worn teeth (a sign of bruxism/clenching) or protrusion of the front teeth/malocclusion (a sign of tongue thrusting). Palpation of the jaw, muscles of mastication, neck, shoulder, and suprahyoid muscles for tenderness suggests temporomandibular joint disorder or bruxism. Palpation for submental, submandibular, cervical, and supra/infraclavicular lymphadenopathy may identify signs of possible infection or neoplasm. Palpation of the thyroid gland may suggest thyroid disease. Examination of the skin and nails may indicate possible nutritional deficiencies. Examination of the joints and skin may suggest connective tissue diseases. A complete neurologic examination with particular attention to sensory disturbances may be supportive of a systemic disorder, such as diabetes or B12 deficiency. No consensus exists regarding a definitive cause. Rather, burning mouth syndrome (BMS) appears to be multifactorial in origin. Many of the currently proposed etiologies describe secondary, rather than primary burning mouth syndrome (BMS). Menopause, whether surgical or physiological, is associated with a higher prevalence of burning mouth syndrome (BMS), and, while the mechanism is unclear, hormonal alterations in oral mucosa have been suggested as a cause. Estrogen has documented effects on oral mucosa, and deprivation may lead to atrophic changes thereby altering stimulation of the nerve endings within the epithelium. Alternatively, atrophic epithelia may be more prone to inflammation. Allergies are infrequently identified in patients with burning mouth syndrome (BMS) but have been suggested as a cause of Type 3 burning mouth syndrome (intermittent symptoms). However, typically they are associated with signs of mucosal irritation. Suggested irritants include dental materials such as mercury (present in amalgam), methyl methacrylate, cobalt chloride, zinc and benzoyl peroxide. Components of lotions such as petrolatum cadmium sulfate, octyl gallate, benzoic acid, and propylene glycol have been implicated. Food allergens include peanuts, chestnuts, cinnamon, and sorbic acid. Nicotinic acid has also been suggested. Deficiencies of B vitamins 1, 2, 6, and 12, as well as zinc  , folate and iron, have been suggested as causes of secondary burning mouth syndrome (BMS), either from direct neurologic damage or in relation to anemia. Anxiety, if present, is usually considered an exacerbating factor, rather than a cause of the chronic pain picture of burning mouth syndrome (BMS). Cases of spontaneous resolution of symptoms after positive life events have been reported. Patients with burning mouth syndrome (BMS) may also have increased salivary cortisol relative to controls, indicative of higher levels of stress. A proportion of patients have anxiety centered around concerns of cancer, or cancerphobia. At this point, the nature of the association between burning mouth syndrome (BMS) and anxiety is not clear. Endogenous or reactive depression has been implicated; however, depression is strongly associated with anxiety. [20, 36] Whether depression is directly connected to burning mouth syndrome (BMS) is unclear. Serotonin deficiency has been suggested as a possible mechanism for sensory alterations in burning mouth syndrome (BMS) because of its role in the descending inhibition of pain. CT scans of the head may be useful if a mass lesion is suspected. MRI of the head, brain, and/or spinal cord may assist in diagnosing mass lesions (either neoplastic or infectious) or other lesions of the nervous system that may explain symptoms such as multiple sclerosis. Thyroid echography is useful if gross thyroid lesions are suspected. Laryngoscopy or endoscopy if reflux is suspected. Patch testing for methylmethacrylate mercury, cobalt chloride, benzoyl peroxide, petrolatum cadmium sulfate, octyl gallate, benzoic acid, propylene glycol, peanuts, chestnuts, cinnamon, sorbic acid, and nicotinic acid among others. Because burning mouth syndrome (BMS) is a chronic pain syndrome, patients must have realistic expectations of the natural course of their condition. For patients with primary burning mouth syndrome (BMS), an estimated 50-66% may have improvement in symptoms after 6-7 years. A small study of 32 patients reported near universal improvement in symptoms within 16 weeks for patients receiving ongoing multidisciplinary treatment. Spontaneous remission is rare but does occur in roughly 3% of patients. These findings are similar to other idiopathic chronic pain syndromes and support the idea that treatment should be individualized based on symptoms. Continued follow-up is also likely help patients with management of symptoms. What is burning mouth syndrome (BMS)? How is burning mouth syndrome (BMS) classified? How is burning mouth syndrome (BMS) classified based on symptoms? What is the likely etiology of burning mouth syndrome (BMS)? What is the anatomy of the oral cavity relevant to burning mouth syndrome (BMS)? What is the physiology of the lingual branch of the mandibular nerve (V3) in burning mouth syndrome (BMS)? What is the role of the anterior and midline portions of the oral cavity in the physiology of burning mouth syndrome (BMS)? What is the neuroanatomy of the trigeminal nerve relevant to burning mouth syndrome (BMS)? What is the role of the spinal nucleus in burning mouth syndrome (BMS)? What is the role of taste in burning mouth syndrome (BMS)? What is the role of salivation in burning mouth syndrome (BMS)? What is the pathophysiology of burning mouth syndrome (BMS)? What is the role of anxiety in the pathophysiology of burning mouth syndrome (BMS)? What is the role of thermal sensitivity in burning mouth syndrome (BMS)? What is the role of trigeminal nerve alterations in the pathophysiology of burning mouth syndrome (BMS)? What is the role of saliva in the pathophysiology of burning mouth syndrome (BMS)? What are the associations of oral parafunctional habits with burning mouth syndrome (BMS)? What are the associations of GI and urogenital disease with burning mouth syndrome (BMS)? What is the prevalence of burning mouth syndrome (BMS)? Which history findings suggest burning mouth syndrome (BMS)? What are the classic symptoms of burning mouth syndrome (BMS)? How is pain characterized in burning mouth syndrome (BMS)? How is throat pain characterized in burning mouth syndrome (BMS)? How is dysgeusia characterized in burning mouth syndrome (BMS)? How frequently is xerostomia present in burning mouth syndrome (BMS)? What are nonspecific symptoms of burning mouth syndrome (BMS)? How is tongue thrusting identified in burning mouth syndrome (BMS)? What are symptoms of anxiety and depression in burning mouth syndrome (BMS)? 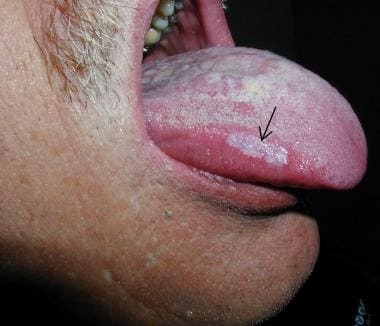 What lesions are present in burning mouth syndrome (BMS)? What is included in the head and neck exam for burning mouth syndrome (BMS)? Which physical exams could be performed in patients with burning mouth syndrome (BMS)? What causes burning mouth syndrome (BMS)? What is the role of menopause in the etiology of burning mouth syndrome (BMS)? What is the immunologic mechanism for the etiology of burning mouth syndrome (BMS)? What is the role of allergies in the etiology of burning mouth syndrome (BMS)? Which dietary deficiencies are possible etiological factors of burning mouth syndrome (BMS)? What is the role of anxiety in the etiology of burning mouth syndrome (BMS)? What is the role of depression in the etiology of burning mouth syndrome (BMS)? What is the role of infection in the etiology of burning mouth syndrome (BMS)? Which drugs may be etiologic factors in burning mouth syndrome (BMS)? What is the role of lab tests in the diagnosis of burning mouth syndrome (BMS)? What is the role of imaging studies in the diagnosis of burning mouth syndrome (BMS)? What is included in the workup of burning mouth syndrome (BMS)? What is the prognosis of burning mouth syndrome (BMS)? What are the treatment options for primary burning mouth syndrome (BMS)? What is the role of topical clonazepam in the treatment of burning mouth syndrome (BMS)? What are the treatment options for secondary burning mouth syndrome (BMS)?